The PDBF on KSPS (video)! Race results from the Penticton Dragon Boat Festival! The PDBF happens on 11 km long Skaha Lake in beautiful, sunny, Penticton, British Columbia, Canada. The event starts with two 500 m qualifying heats on Saturday. Racing continues with semis Sunday morning, and finals Sunday afternoon. Race results from the Okanagan Super Sprints! 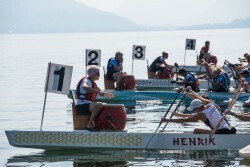 The OSS are 250 m sprints, held on Skaha Lake in Penticton, in June. This fun event offers head-to-head racing over a shorter distance, allowing teams to practice all their race-specific tactics. Starting in 2016, we’ve also added a day of racing for 55+ teams. Learn to Dragon Boat this Season! The Penticton Dragon Boat Festival is a premier summer dragon boat festival that takes place annually in September in beautiful Penticton, BC, Canada at Skaha Lake Park. The 2-day festival features Millennium dragon boats and one of the prettiest race sites in BC. In a weekend full of firsts, Penticton Dragon Boat Festival test drove the idea of a dragon boat “tug of war” in our community centre pool. Big thanks to the City Of Penticton for their support. Look for a two day event next year, sometime in March, 2020…. 24 paddlers took part in the Okanagan’s First Indoor paddle event. Big thanks to the City of Penticton for the loan of a much bigger room, with windows! And thanks to everyone that came out. We had 24 paddlers out for this morning’s indoor races! A huge thanks to the City Of Penticton for their support, and thanks to Penticton Western News for coming out. It’s April, fools! The @pentictondragonboat Indoor Regatta is on now at the Penticton Community Centre! Cheer on paddlers through their time trials and distance races as they get ready for the final 3000m relay later today! Penticton’s dragon boat community has maintained a “fleet” of paddling machines at the Penticton Community Centre for several years, allowing paddlers to train over the winter while the lake is frozen, or the weather too cold.